Eco Kayaking. View beautiful wildlife from a kayak here in Cornwall! Explore the cliffs, caves and caverns home to local seals! Newquay’s native wildlife and coastal flora take centre stage on our unique, environmentally focussed eco kayaking tours. Sit back, relax and enjoy the scenery from your own sit-on-top kayak! This will appeal to nature lovers who enjoy a twist of adventure. Enjoying the local area whilst helping ensure its protection is our passion at Newquay Activity Centre! We’ve pioneered an educational version of our popular kayaking tours, with specific focus on the area’s native marine habitats. 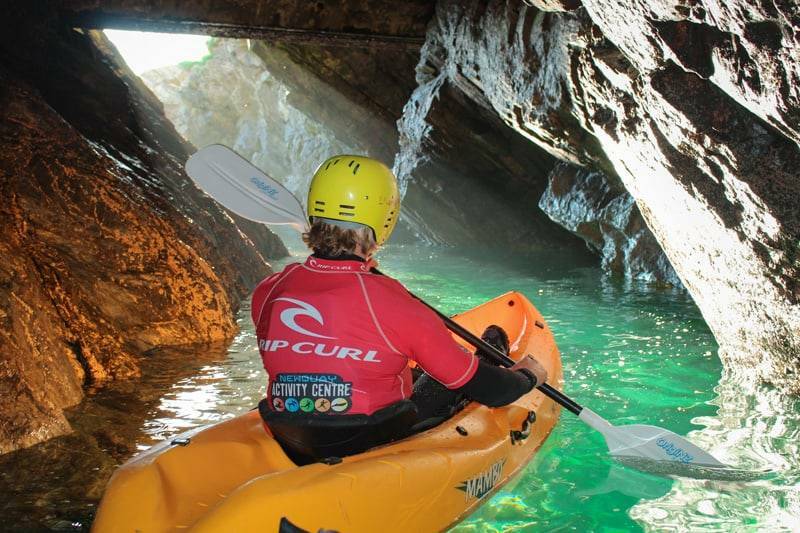 You’ll get kitted out in a wetsuit, buoyancy aid and helmet before negotiating Newquay’s Gazzle route with one of our enthusiastic and highly qualified kayaking leaders. Tuition for all ages and abilities. The session is pitched to suit the groups dynamic with regular stops to up-skill, enjoy the location or play games. We’ve developed our kayaking routes in collaboration with the Cornwall Wildlife Trust to give our instructors an in-depth knowledge of the area’s flora and fauna. Together you’ll discover the local seal colonies, lobsters, seabirds, crabs and smaller wildlife that call our coastlines home. Smugglers caves, natural rapids, craggy inlets and hidden coves; our coastline holds a host of secrets just waiting to be discovered. Kayaks provide a great perspective from which to see the dramatic cliffs, caves and caverns of our craggy cliff lines. Our reviews on Trip Advisor rank Newquay Activity Centre as number one for Cornwall activities and we’re proud double golden winners of the Cornish Tourism awards. Tales of the area’s rich history and heritage. Including maritime and military history as well as myths and legends.